It was a very good way to spend an hour or two on a Sunday, and should be repeated regularly! With a week of wet weather still ongoing on Sunday morning, things were looking a little grim for a ride. 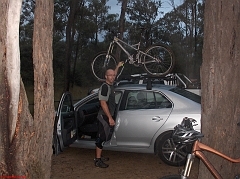 However, despite a bunch of 'almost going to make it' folk pulling out at the last minute, Paul, Cooper and Stephe travelled out to Yarramundi in the early afternoon, to see what the weather had done to the Yellowmundee track. We arrived at 3pm, just as car loads of young folk were pulling out of the main car park, following the "Jet Black" cross country school championships (or something like that). Some very impressive looking kit, and we were told by an organiser while she was packing up that they had around sixty schools there for the event. In any case, by then it had stopped raining, and was actually a very pleasant 19 degrees. The track was in really good condition, with lots of smooth hard packed sections. There was a new twisty short downhill section with some interesting steps, which Cooper managed to almost lose control on, only to regain the bike, but then overcook the front brake in his excitement at having won back control. Which led to an interesting front wheel 'stoppie' down a hill, and then the inevitable semi-vertical tree hug. Amusing to watch (given that there were no broken bones). Some interesting slick black skin on the hard packed mud made for sliding technique practice on the back half of the course, but no harm was ultimately done and much fun was had. Our only three photos that worked (dodgy as they are) are here..., and a .kmz track of the loops we did is here. The long weekend continued its run of surprises, as Brian, Gabbie, Joe, Gus and Hugo joined Sue, Stephe, Cooper and Ethan for an investigation of Sparrow Hill. Although we were not too sure exactly where to go, it became clear as we approached the twenty or so parked mountain bike carrying cars, that we were in the right place. After some kerfuffle with lost skewer bits, we managed to get underway. And what a delight underway turned out to be... a lightly overcast Canberra day was perfect for disappearing under the canopy of the pine forests. We navigated on to the rim track, and stuck with it for around 25 km or so. A simple and enjoyable track, which clearly offered many more challenges, or was happy just being enjoyed the way it was. Another one to definitely return to! CORC's map of the area (.pdf format, 400kb) is here. 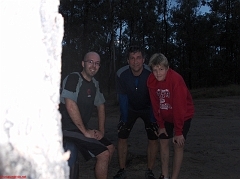 Cooper and Stephe turned up to meet the nice folk from the Canberra Off Road Club, who were nice enough to show us around some of the lower level cross country tracks at Stromlo. We both had a chance to do our first ever see-saw, followed by a couple of subsequent attempts, together with a very cool ride back down including a decent berm... the joys of novelty, eh! We also had the pleasure of the company of a dozen or so locals, all of whom were very nice to us, and ended up in the middle of a time trial for some women from the Institute of Sport, each of whom was very impressive. Despite being a fairly desolate place, seems clear that it will be worth exploring much further in future - in particular, climbing the hill and doing the berm track back down. And the fact that the car park can have quite a few cars in it, but still not see too many folk on the tracks can only be a good sign of much goodness spread around. Our not overly ambitious (13km in two hours, but there was *lots* of talking...) track (.kmz) is here. Donal and Stephe managed a cheeky little Friday afternoon wander into Terry Hills, including yet more track that Stephe had never seen before. Turns out (again) that the many years of 'dissing' Terry Hills may have been a tad harsh (although there was still mainly firetrail and some bitumen transitions). But there were also some great and challenging hill climbs / descents which made for a bit of fun. As did finding our way back out of the place as darkness fell, without lights. No photos, and even the GPS decided to give up on me. Ah, bugger.